Dallas star Linda Gray has been spotted filming Hollyoaks in Liverpool – after flying into the UK to take part in the soap. The 76-year-old Eighties icon first briefly appeared on the Chester-set Channel 4 series in November as new character Tabitha ‘Tabby’ Maxwell-Brown. In her first episode, Linda’s alter-ego spoke on the phone to onscreen daughter Marnie Nightingale, played by Lysette Anthony, from a glamourous foreign location before appearing in a handful of episodes in a storyline which saw her fly in from LA to reunite her family in the Chester village. 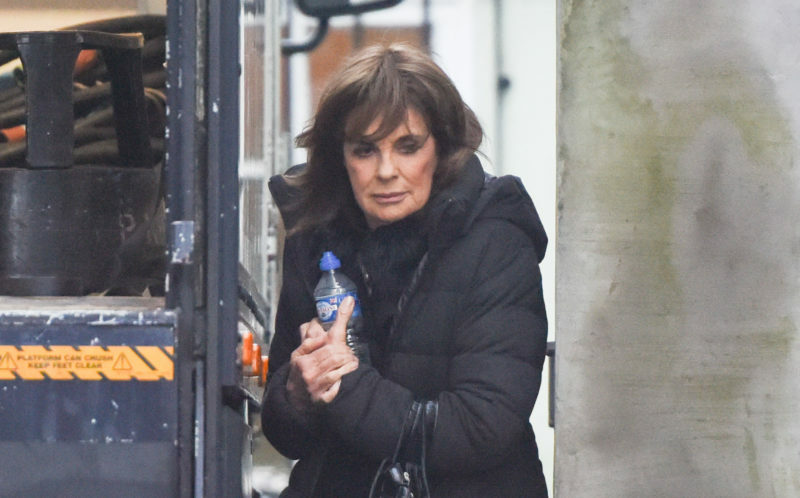 But yesterday (TUES) Linda, who is best-known for playing Sue Ellen Ewing in iconic US soap Dallas, swapped sun-drenched climes for grey Merseyside skies to film at St Bartholomew’s Church in Rainhill. Linda is believed to have flown into the UK earlier this week to shoot the soap at the imposing gothic church alongside Hollyoaks regulars. It is not known what scenes she and her colleagues were filming, but several characters appeared to be dressed in black – although Linda still looked glam with a roller in her hair in true Liverpool style. Reports suggest after Linda’s initial guest appearances in November she later landed a new contract with Hollyoaks to appear in the show more permanently on a semi-regular basis.